Product information "HAIX Black Eagle Athletic 11 Desert High"
The HAIX Black Eagle® Athletic 11 High Desert Side Zip Boot is an extra-light boot designed to be worn anywhere – on or off duty. Built metal-free to be friendly with airports, it combines the comfort of an athletic shoe with the durability of German design. We made sure to add extra cushioning in the heel, and spring-back material to increase the shock absorption and comfort; Perfect for both standing long hours on cement, or running hard across it. The Pronation and Supination support keeps the bones of your foot and ankle in their ideal positions, distributing weight evenly while you stand. This support helps prevent injury, and reduces the aches and pains that might otherwise spread across your body after being on your feet all day. The Anti-slip soles are made with a unique tread design and rubber blend, to help grip many surfaces. They’re resistant to oil and gasoline, and will not mark up your floor. Within the sole itself is a sturdy Stone Shield, to protect your feet from sharp stones or other obsticals you could encounter on uncertain terrain. It reduces the peircing ability, to keep your steps sure. The HAIX Black Eagle® Athletic 11 High Desert Side Zip Boot features the patented Two Zone lacing system which allows you to easily adjust the upper and lower parts of your boot’s laces so that it can snugly hug every part of your foot, for maximum comfort and protection. Just slide the boot on, zip it up, and adjust the laces to fit comfortably on your foot and ankle. After that, you’ll be able to get in and out of your boot as fast as you need – safe feet are just a zip away. With Pronation and Supination support already built in, your ankles are further protected by a sturdy side-pad, to reduce injury from any outer blow that may come from performing active duty work. The combination of leather and textile uppers makes this footwear flexible and breathable, to hug your feet wherever you need to go. Worried about sweaty feet? The HAIX Black Eagle® Athletic 11 High Desert Side Zip Boot's breathable microfiber design has been paired with our HAIX Climate System, to keep your feet cool and dry. Our machine-washable insoles further help wick away moisture, while providing extra cushion and comfort. The optional add-on Black Eagle® extended limited warranty makes choosing the Black Eagle Athletic 11 High Side Zip Desert a no brainer. Once you purchase these boots, you’ll never look for any other pair again. Related links to "HAIX Black Eagle Athletic 11 Desert High"
Our comment on "HAIX Black Eagle Athletic 11 Desert High"
Customer reviews for "HAIX Black Eagle Athletic 11 Desert High"
I bought these boots because the Mission Desert Tan boots by Haix have soles that are kind of large especially the heel and make driving my car difficult so I chose these cuz the there is no protruding heel the soles are pretty flat and the boots are Very Comfortable and they have the side zipper to put on take off Very Fast which the Mission Desert Tan do Not! Great pair of boots! I put them on the first day and wore them 12 hours! Very good fit. Very comfortable. This my second purchase of these HAIX Black Eagle Athletic 11 Desert High boots. I am sold, on the fit and the features! have been using these boots 5 days a week 3 weeks straight 13 hrs a day pure comfort no back problems or knee i'm using these boots in the worst case they hold up far better than anything out there and still in total comfort love these boots oh as for water repel hmmm yeah i got them soaked in a downpour they dried super fast on my feet an i never stopped working excellent boots. Excellents boots, great price for the quality of the products... and the shipping is fast. Thanks for making a great boot. I usually don’t write reviews but I have to on these boots. I’m on my feet 12-14 hours a day and I’ve tried different boots. The last two were UA and they are the worst I’ve ever worn. I’m a UA fan, on everything but footwear. My feet have been in a mess. 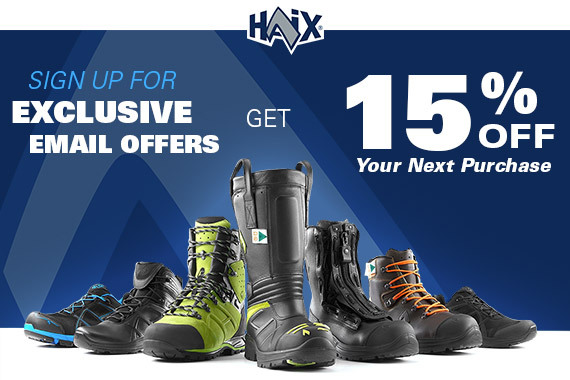 I found the HAIX website while searching for new boots and after reading all reviews and product details ( more than a few times ) I decided to give them a try. I’m so glad I did!!! I don’t plan on wearing any other brand. Anyone reading these reviews do yourself a favor and order these boots. I had a question on sizing and the customer service response was fast and gave me accurate advise. I took their advise and the boots fit perfectly with no break in needed. These are the most comfortable, lightest and awesome boots for everyday use I have ever owned, and I am 63 year old. The boots literally put a spring in my step! They are worth every cent! A month in and I am very happy with these boots. I wear a 13 and these boots fit like a glove, snug bot not too tight, light on the foot, and a comfortable toe box. The side zipper is great for easy on and off and the seams are comfortable on the inside. I tried a Reebok tactical boot and sent it back the very day I received it, but this boot was comfortable right out of the box. I wore it for 12 hours the other day while helping a friend move and found it to be comfortable the whole day. I will also be purchasing a pair of the Black Eagle Tactical which the GORE-TEX / HAIX climate system! Oh, and the customer service was top notch! This is how business should be done. Thank you for sharing your experience with the Black Eagle Athletic 11 High Side Zip. We are happy to hear that you find these boots to be light, comfortable and the perfect fit. We are also glad that you like the side zip which allows you to don and doff this boot with ease. It is great knowing that you like these boots so much that you plan on buying a pair of our tactical boots as well. We hope your new boots serve you just as well as these seem to be. We pride ourselves on excellent customer service and we are pleased that we were able to help with your needs. We appreciate your comments and your loyalty to the HAIX brand! i wear it from 7am to 22 Pm and i don't have any probleme. Thanks for the positive feedback on the Black Eagle Athletic 11 Desert High. We are happy that these boots are comfortable even when wearing them for long hours on duty. We hope you will continue to be a loyal HAIX customer in the future. Stay safe out there! Best boots ever, very comfortable, right out of the box. Thank you for your feedback on the Black Eagle Athletic 11 Desert High. We are happy that you found these boots to be comfortable right out of the box and that these are the best boots you've ever worn. What a compliment! We hope these boots continue to serve you well in the future. These are the best boots I've ever owned. I started purchasing 2 pair at a time in 2006. I'm on 10th set. I've got over 30 years of Service with 2 agencies as Tank Commander and a Sheriff. I've worn alot of different boots, by far these are the best. Please consider making them in Sage and possibly Multicam. We really appreciate your feedback on the Black Eagle Athletic 11 Desert High. We are happy to hear that these are the best boots you've ever owned! The fact that you are on your 10th pair is amazing! We appreciate your loyalty to the HAIX brand. I will definitely pass your suggestions up the chain of command for consideration. Can be worn all day everyday right out of the box. Very comfortable, lightweight, durable and long lasting boot. I have a black pair and now the desert tan color. Combined with the convenient side zip, makes purchasing this boot a no brainer. Highly recommend and worth the money. We appreciate your feedback on the Black Eagle Athletic 11 Desert High. We are happy to hear that you found these boots to be lightweight, comfortable, and durable right out of the box. Thank you so much for the recommendation. We appreciate your business and your loyalty to the HAIX brand. These boots are RIDICULOUSLY comfortable, not to mention casually stylish. Whatever your day's activity, they serve their purpose well. You could walk around a theme park all day or even jog in them and you wouldn't regret it. A bit pricey, but you're paying for quality. Only complaint, the tongue does protrude out, which in turn pushes your pant leg out slightly. That said, it's not enough of a drawback to deter me a second purchase. I'll likely buy the black color of the same boot in the near future. Thank you for taking the time to share your feedback on the Black Eagle Athletic 11 High Side Zip Desert. We are happy to hear that you find these boots to be comfortable and stylish. These are definitely meant to be worn on or off duty and we are glad they are serving their purpose for you. As far as the protruding tongue, I will pass your concerns along to management for consideration. Again we appreciate your review and your loyalty to the HAIX brand. These boots are excellent quality. Very true to size and very comfortable. Very, very little break-in time. Comfortable all day long. Feet stay relatively dry after a full shift. Outsole is quality rubber. My feet are flat, but these boots really do support my feet. And the pronation support really works. These boots are worth every penny. Glad I found out about Haix! We appreciate you taking the time to share your experience with the Black Eagle Athletic 11 High Side Zip Desert. We are happy to hear that you found them to be supportive and comfortable and that your feet stay dry all day long. We hope these boots continue to serve you well in the future.